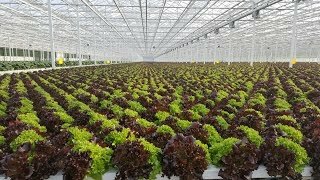 American Ag Energy is a controlled environment agriculture company that integrates electric power generation with greenhouses to grow vegetables. The company produces high quality, locally grown, and good tasting vegetables with little environmental impact. The company's technology results in significant energy and water savings and generates important economic advantages. The company's staff consists of experienced growers, engineers, and scientists who have successfully managed similar activities in the past. The company's efforts are restricted to the Northeastern United States where 95% of the vegetables consumed are imported. The company delivers its products to its customers the day after they are picked ensuring good taste and high nutritional value. The company expects to develop a number of these projects in its market area and anticipates building approximately 400 acres over the next 5 to 7 years. These efforts are expected to lead to significant revenues and cash flow. The company will be producing high quality, great tasting, locally grown tomatoes and salad greens in an socially and environmentally sustainable way. . Tomatoes: The company will grow high brix level tomatoes of the following varieties: tomatoes on vines, cherries, beefsteaks, grape, and cocktails. Salad Greens: The company will grow and package numerous salad greens including bib lettuce, lolla rosa lettuce, baby bok choy, kale, russian kale, chard, arugula, frisee, watercress, mixed salad greens, and spinach. Richard spent many years in the greenhouse and florist business, first as laborer and ultimately as grower and buyer at Harry Quint Greenhouses. Later, he began his professional career at Abt Associates advising federal government agencies, and while at Abt he was instrumental in formulating the Clean Water Act. He founded a series of energy and environmental operating businesses, serving in a variety of roles including CEO, Chief Engineer, Chief Scientific Officer, President, Consultant, Chairman and Director. ERCO Petroleum Services designed and constructed fluidized beds for clients such as Clorox, Tennessee Valley Authority, Tenneco, Combustion Engineering, and others. ERCO was sold to NL Industries and its laboratory affiliate was sold to Corning. Dr. Rosen has extensive experience building operating facilities including one to remodel landfills using a patented technology. Dr. Rosen earned a Master’s Degree in Forest Science and a Ph.D. in Engineering from Harvard University.